I moved back to Perth in 2010, having grown up here, gone to school, University and started my career here. It’s a lovely city, with the metropolitan area sprawling north and south along the blueÂ Indian Ocean for some 50+kms. They says it’s a bit of a Mediterranean climate, normally never going below 0Â°C, and the heat of summer hitting mid 40Â°C, but with a fresh westerly coastal breeze appearing most afternoons to cool the place down. But it is rather remote from other major population centers. The next nearest capital city, Adelaide, is 2,600 kms (1,600 miles) by road. 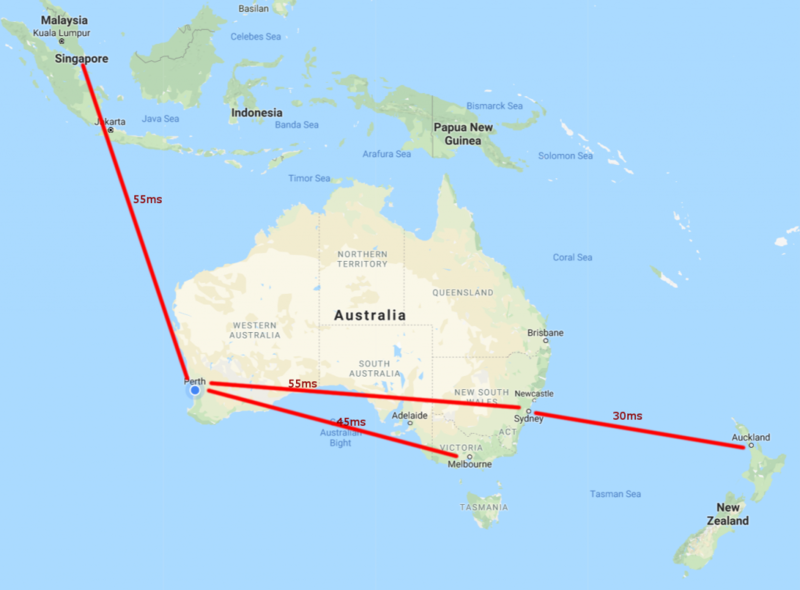 Melbourne is 3,400 kms (2,100 miles) on the road, and Sydney is 3,900 kms (2,400 miles).Â It’s a large state, some 2.5 million square kilometers of land, the size of the US Alaska and Texas states combined. So one thing those in technology are well aware of is latency. Even with fibre to theÂ premises (NBN in Australia), the Round Trip Time to Sydney is around 55ms – which is a similar time to Singapore. Melbourne comes in around 45ms. In 2013 I met with theÂ AWS CloudFront team in Seattle, and wasÂ indicating the distances and population size (circa 2 million) in Perth. There’s a lot of metrics that goes in to selecting roll-out locations (Points of Presence) for caching services,Â with latency, population size, economic prosperity, cost of doing business, customer demand from a direct customer model, and customer demand from an end-consumer model being weighed up. This week (1st week of January 2018) AWS CloudFront launched in Perth. This impact on this is that all web sites that people of Perth that use CloudFront will now appear to be faster for cachable content. The latency has dropped from the 45ms (to Melbourne) to around 3ms to 5ms (from a residential NBN FTTP @ 50 Mbit/sec). Test at 9:30pm from Perth (iiNet NBN). In addition, the ability to upload/send data to applications (Transfer Acceleration) on-Region via the Edge (Edge Upload) may now also make a difference; with 45 ms to Melbourne, its been a largely unused feature as the acceleration hadn’t made much of a difference. There is a Transfer Acceleration test tool that shows what effect this will give you; and right now, while it shows an advantage to Singapore, just a 7% increase in performance to the AWS Sydney Region. Its not clear if TA via the Perth PoP is enabled at this point, so prehaps this will change the result over time. And so, after several years, and with other improvements like the ability to restrict HTTPS traffic to TLS 1.2, it now makes sense to me to use CloudFront for my personal blog. In an hour, I had applied a new (additional) hostname against my origin server (a Linux box running WordPress) by editing the Apache config, symlinking the wordpress config file, and adding a Route53 CNAME for the host. I had certbot on Linux then add the new name to the Let’s Encrypt certificate on the origin. Next I applied for an Amazon Certificate Manager SSL certificate, with the hostname blog, and (if you inspect it) blog-cloudfront.james.rcpt.to. I then created a Cloudfront Distribution, with one origin, but two behaviours – one for the WordPress admin path, and one for the default paths, so that I could apply additional rules to protect the administration interface. With this in place I could then update the DNS CNAME to move traffic to CloudFront, without any downtime. Not that downtime matters on my personal blog, but doing exercises like this you need to practice. PS: It’s worth noting that IPv4 DNS resolution for my CloudFront distribiution is giving me 4ms RTT from Perth, but IPv6 RTT is 52ms, which indicates that IPv6 CloudFront has not yet arrived here.